NYC Mayor Bill de Blasio speaks during a news conference April 9 declaring a public health emergency in response to a measles outbreak. De Blasio's order becomes a full-page advertisement in Friday's Daily News. New York State is in the grasp of two infection outbreaks that may leave Western New Yorkers wondering about their own risk. One outbreak is the spread of highly contagious measles. The other is a drug-resistant and highly contagious fungus with the less familiar name of Candida auris. 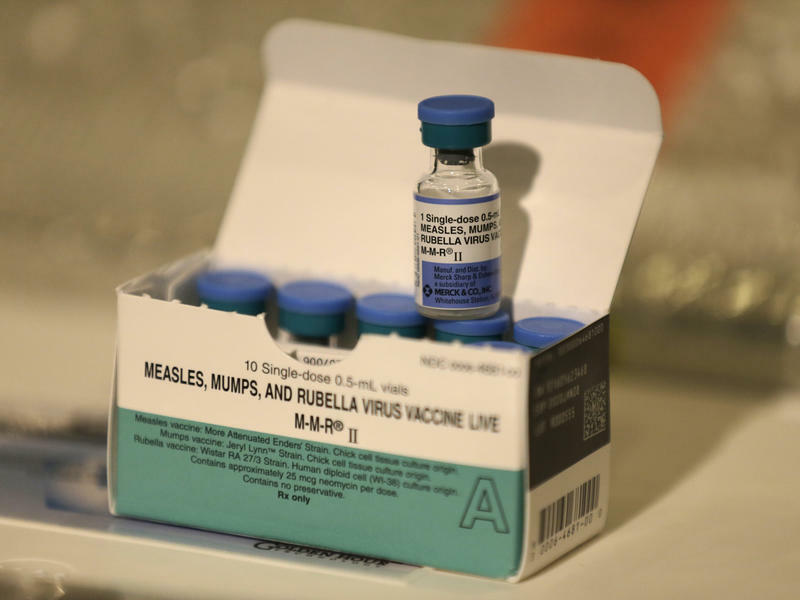 On Tuesday, New York City declared a public health emergency and called for mandatory vaccinations against measles. The emergency covers four Brooklyn zip codes, including most of Williamsburg and Borough Park, which have seen nearly 300 cases of the measles since October. Unimmunized children and adults without a medical exemption could face misdemeanor violations and fines. 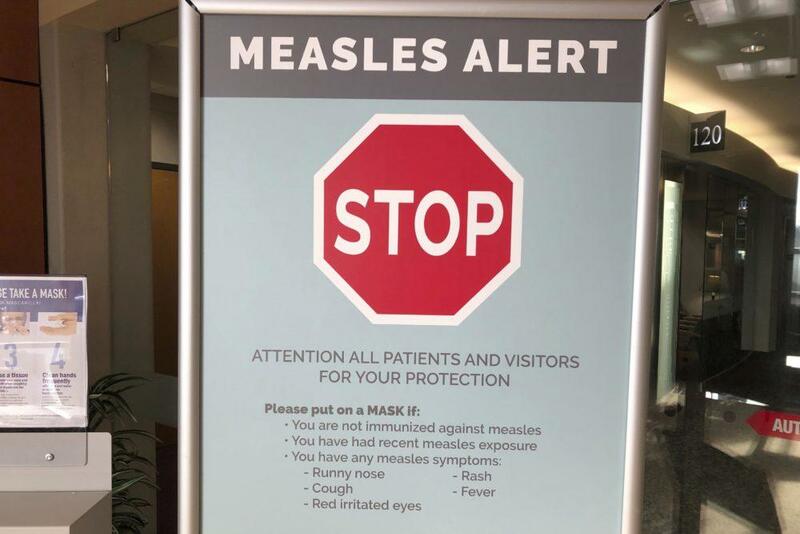 Signs warn patients and visitors of a measles outbreak in January. That declaration followed a decree on Monday that all yeshivas in Williamsburg should exclude unvaccinated children or face an immediate violation and possible fines and school closures. There is particular concern in Williamsburg, where the NYC Health Department says a low immunization rate among Hasidic and Orthodox Jewish communities is causing the virus "to increase at an alarming rate." The NYC order became a full-page advertisement in Friday's Daily News. All this has sparked action by NYC civil rights attorneys, who say the city has overreached its authority mandating vaccinations and they plan to sue. What about Western New York? Locally, Erie County Health Commissioner Dr. Gale Burstein reminds Western New Yorkers that the county confirmed only one recent case of measles - at the end of last year. She said the individuals were quarantined and no further cases resulted. 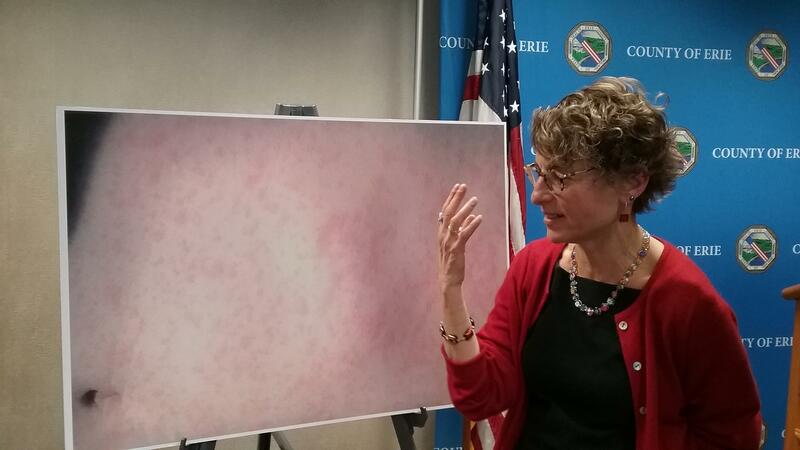 "In Erie County, we have very high immunization rates of children for measles," Burstein told WBFO. "Looking at New York State data collected from schools, we know that all of our school districts have at least 95 percent of their students who are up to date on their measles vaccine." Erie County Health Commissioner Dr. Gail Burstein talks about the local measles case in December. Burstein said a lower suspectible population translates into a lower risk of seeing measles in the community. This is referred to as "herd immunity": an immunized population of at least 93 percent works to protect even those not vaccinated. "Whereas in a community where there are a lot of suspectible people that are not immunized, it's very easy for the virus to infiltrate the population and then spread very quickly," she said. Herd immunity in New York State is helped by the measles vaccine being a school entrance requirement, unless a medical exemption is approved. "For example, we know Orchard Park would not allow some students to enter their school district because they were unimmunized," Burstein said. "However, there are children that attend private schools that do not require imunizations and there are children who are home schooled and do not have the requirement." She said state school survey data report all WNY schools districts are above the 95 percent immunization rate. She acknowledges that while other vaccinations are required or recommended for children, measles has the "unfortunate" - and misguided, Burstein said - connection to causing autism, which helps continue resistence. What is Candida auris (CAN-did-ah OR-ihs)? In addition to the measles outbreak, the Centers for Disease Control and Prevention report New York is suffering an outbreak of a drug-resistant and contagious fungus called Candida auris that can show no symptoms or turn into a serious medical condition, even death. Public health professionals are still learning about the C. auris, but they know it is a global problem and spreads between patients at healthcare facilities. The outbreak in New York is of particular concern because the relatively new fungus strain - identified only a decade ago - has been a threat outside the United States until the last several years. As of March 18, New York State confirmed more than 300 confirmed cases in the state since October. More than 400 others were tested "as part of a public health investigation." "U.S. cases of C. auris have been found in patients who had recent stays in healthcare facilities in India, Kenya, Kuwait, Pakistan, South Africa, the United Arab Emirates and Venezuela, which also have documented transmission," according to the CDC website. New York has reported the most cases, followed by Illinois (nearly 150, mostly the Chicago area) and New Jersey (more than 100) - all international hubs. The next most cases (12) have been confirmed in Florida. Given the increasing number of people who travel internationally to and through Western New York, Burstein said it wise to watch. "Unfortunately, we are seeing it here in the United States among people who are already ill with another health issue, so that would be people who are already hospitalized with a serious health conditions or our seniors who are living innursing homes," Burstein said. "The symptoms really depend on the site of infection, so it could infect a wound or it could affect the blood stream, it can infect the central nervous system, so people can develop Meningitis and Encephalitis." Burstein said basic tenets to protect against any infectious diseases - especially people who travel abroad, where different countries have different requirements and conditions - apply to both measles and C. auris. She recommends the CDC's Travelers' Health website for details and said some immunizations can be given in Erie County's travel clinics or at a traveler's primary care practice. "Another basic tenet is wash your hands when you go into a developing country or even her in Erie County. Wash your hands as much as you can because that is highly protected," she said. "It'll wash off the bacteria or the viruses that you might have been exposed to." The Center for Disease Control reports individual cases of measles have been confirmed in ten states and that includes New York. Four cases were confirmed earlier this week in the Rochester area. WBFO's senior reporter Eileen Buckley spoke with the Erie County Health Commissioner about the importance of getting children vaccinated. WBFO's senior reporter Eileen Buckley spoke with the Erie County Health Commissioner about the importance of getting children vaccinated. The Erie County Health Department is investigating a possible case of measles at Williamsville South High School. Exposure may have occurred on Friday.